The photo [above] tells much of that history, says Mansbach, a resident of Beit Shemesh. 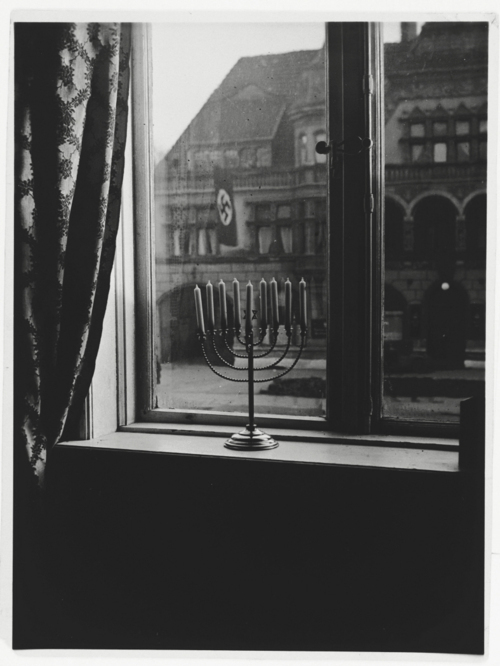 “In this photo you see the Hanukiyah stationed at a window, with a Nazi flag across the street.” The photo was taken in 1931, says Mansbach, long before the Nazis came to power. But, as it happened, the house of Rabbi Posner, who led the community of Kiel in Germany, was right across the street from the local headquarters of the Nazi Party. Indeed, Mansbach says, many did leave, and by the time the Nazis came to power, some half of the congregation had already emigrated, mostly to the U.S. and the Land of Israel. The Hanukiyah made it to Israel as well, and ended up in Yad Vashem. But each year they make sure to “borrow” if for their family Chanukah celebration. May the light of truth continue to burn brightly. A warm and heartfelt article . One of the strengths of the article was that the writer had avoided lowering the debate for political purposes. He possibly knew others would come along to do this for him. Either that or he thought some words stand on their own without being mangled . It is self exile. I get moderated virtually every post there and hate it ..you lose the thread ( if you pardon the expression) . I suppose I shouldn’t keep calling them hypocrites but why hide the truth ? I just could not help noticing that a gentle ,evocative article ,rich in history and meaning is used by some to make petty political points. You think you are supporting the site but you are making it an easy target . Sometimes less is more. What a wonderful heart-warming story, one of the few from that era which has a fairly happy ending. The picture on its own is incredibly evocative, encapsulating the entire black period of German history in one window frame. I remember the photo from (I think) last year. Thanks for the rest of the story. Truly inspirational. Nothing more to say. An incredible piece of history.